The secondary reason was the “testing process” all potential Man of Light Souls faced from May 26 to August 2, 2016 to test his or her intentions in the endeavors of Mother Earth’s evolving Fifth Dimension. On August 22, 2016 everything in Mother Earth’s Fifth Dimension Transition will begin into motion once more until Mother Earth finally completes the entirety of her Transition on March 27, 2017! Where we are now is within Mother Earth’s Middle Transitionsegment of her Fifth Dimension Transition, which began on August 12, 2016 when she aligned her Sacral Chakra into the Universal Grid of Sun-Stars. The next Chakra she will align into the Universal Grid will be her Third Eye Chakra on October 3, 2016. On October 4, 2016 Mother Earth will then initiate the physical transformation of her body as a Light-Bodied Being. In between Mars’ achievement of its “return point” and Mother Earth’s physical transformation is the month of September 2016! The vast majority of Mother Earth’s initial support for becoming and transforming into a Fifth Dimension Creator Planet predominantly originated from the Universal Grid of the Sun-Stars, principally from our Sun and our Sun’s support through the Universal Grid of Sun-Stars. It is however, Mother Earth’s innate potential of Becoming and Being a Fifth Dimension Creator Planet that will allow her to achieve the physical transformation of her body into a Light-Bodied Being! Her innate potential is not derived within the physical material composition of her body but from her Soul! Likewise, dear Ones, it is our own Soul’s Essence that generates the innate potential of our bodies to also initiate and achieve our own physical transformation into a Light-Bodied Being on October 4, 2016! The content of Mother Earth’s Soul, like our own Souls, is an exact replication of the Universal Light, Love, and Harmony comprising all of the Universe’s Sun-Stars in every minute detail! What may currently appear on Earth as if we are decades or even centuries away from achieving, the Brotherhood of Light, is actually just around the corner! Every Soul on Earth, like Mother Earth, IS THE LIGHT, LOVE, AND HARMONY OF THE UNIVERSE but requires his or her acknowledgement to enact this Truth and place it into motion, for the month of September 2016 will serve to initiate the timing of every Soul’s return to his or her Soul’s Truth and the acknowledgement the Soul will need to transform itself! Our Earth does not function in isolation or within a vacuum, our Earth functions in tandem with our Sun as a life support center. Our Earth is also part of our Sun’s network of planets sustaining their own life supporting Energy from our Sun as a part of its Solar System. Our Sun and its Solar System is just one of billions of Solar Systems within the Universe. The Sun-Stars themselves function as a vast network of generators and life support centers of Light, Love, and Harmony throughout the Universe no matter how close or far apart they may seem to be! There are no barriers between them except open space! Every Soul upon Mother Earth similarly does not function in isolation or within a vacuum, for we all depend upon Mother Earth and our Sun for our life sustaining support. Our Earth contains many landmasses serving to support many Souls within the many habitable regions of her landmasses. Natural barriers such as mountains, deserts, oceans, rivers, and lakes serve to divide Earth’s habitable regions. Mother Earth’s natural barriers serve like the vast regions of seemingly open space between the networks of the Universe’s Sun-Stars! But unlike the naturally shared barriers of open space between the Universe’s Sun-Stars, our Mother Earth is divided by the component of unnatural barriers – nationalistic boundaries! 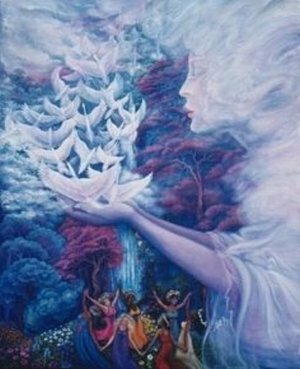 In Mother Earth’s Fifth Dimension, Mother Earth’s body will not need any nationalistic boundaries, as every Soul on Earth will need to return to his or her Soul’s innate Truth in order to acknowledge and transform itself with Mother Earth! From September 2 through October 4, 2016 Mother Earth will be aligning through our Sun with the Universal Grid of Sun-Stars to become an abode and domain of the Unity with God for the Universe’s Fifth Dimension! Immersed within this alignment on September 29, 2016 will be the need for every Soul merging into Mother Earth’s Fifth Dimension to align into the Brotherhood of Light as the initializing core group of Souls responsible for Re-Creating Mother Earth for the Fifth Dimension! The Brotherhood of Light will initially be comprised of solely Lightworker Souls but will incorporate Man of Light Souls once the completion of Mother Earth’s Fifth Dimension Transition occurs on March 27, 2017. The main theme the Brotherhood of Light will be promoting for Mother Earth’s Fifth Dimension will be to “work together in Unity with God, Live together in Unity with God!” The work of the Brotherhood of Light will not be immediately influencing and impacting the lives of the many on Earth, but will be forming the core leadership of Mother Earth to teach, guide, role model, and demonstrate every facet of life required in Mother Earth’s evolving Fifth Dimensional Reality! When the Energy of October 4, 2016 arrives on Earth, the chaotic level of events currently producing everyone’s immunity to the heightened level of traumatic events around the world will be increasing to an even more unbearable level! Not because everyone is listening to his or her Soul, but just the opposite! What one is in his or her thoughts, words, and deeds, one will Be in Mother Earth’s initializing Fifth Dimension! When the Energy of October 4, 2016 arrives on Earth, Mother Earth will begin the initializing process of physically transforming her body into a Light-Bodied Being! Every Soul upon her body aligned with Mother Earth’s Fifth Dimension Harmony Vibration Field will likewise also be initiating his or her own process of transforming into a Light-Bodied Being. Mother Earth’s body, as well as our own, will be transforming into a direct correspondent of the exact composition comprising the innate potential of our Souls! Those whose thoughts, words, and deeds are not aligned within Mother Earth’s Fifth Dimension will be purging the many contagions from their Souls and bodies and producing multiple toxic waste-like cesspools all over the world! It did not have to be this way, dear Ones, but through the accumulation of many Lifetime’s of experience with the illusion of separation from God and the need to survive within the parameters of a subjective reality, many were led to assume they were a mere body experiencing the parameters of Earth rather than a Soul experiencing Mother Earth through the parameters of a physical body! On August 22, 2016 everything in Mother Earth’s Fifth Dimension Transition will begin into motion once more and initiating an entirely New Reality through the formation of the Brotherhood of Light and the return of the Soul’s innate potential of possibilities! This entry was posted in Uncategorized and tagged "return point", ascension, Brotherhood lof Light, love, mars, September 2016. Bookmark the permalink.